Hydra island, sometimes called Idra, despite being a haven for day-trippers out of Athens and a frequented tourist resort has a very picturesque port, around which the main city, Hydra port, population less than 2000, is built on the slopes. Hydra seems to absorb its tourists well; it's a place that's been well managed over the years. With these conditions, as you might expect, Hydra is also a haven for artists. No cars are allowed anywhere on the island. Although garbage trucks are allowed, public transportation comes via donkeys, bicycles, and water taxis. 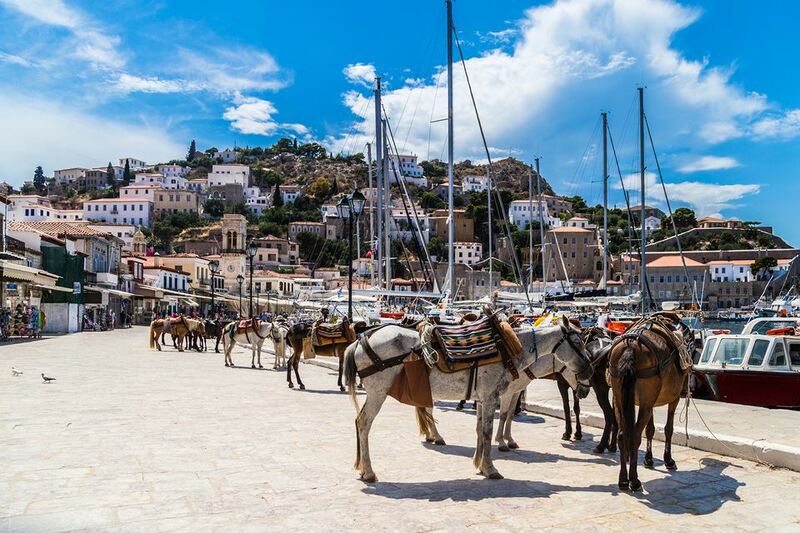 Donkeys at the port may take your bags up the steep slopes to your hotel. Have your camera ready. Hydra is located in heart of the Saronic Gulf, close to the islands of Spetses and Poros. There are a few other small hamlets sprinkled about the island that you might walk to. You can take the ferry from Athens port of Pireus to Hydra in about 3 hours, at a one-way cost of under 7 euros (see our transportation links below). You can do a round trip with stops at Aegina, Methena or Poros. You can also take the faster hydrofoils, the Flying Dolphins, which take about an hour and a half. From Hydra, you can take a flying Dolphin to the island of Spetses or the town of Nafplion, where there is a great castle. See Ferries Direct for more. Hydra is one of my favorite little ports to visit. Combine it with a trip to other Saronic Gulf Islands, and you'll have yourself a nice couple of days vacation. Hydra Town claims to have 365 churches. You might want to visit the 18th-century Monastery of the Assumption of the Virgin Mary on the waterfront, which gets much of its charm from its marble building blocks scavenged from the Temple of Poseidon on nearby Poros. There are also Captain's Mansions. The Tombazi mansion makes up the School of Fine Arts, one of the 7 Annexes of the Athens School of Fine Arts. The view from the mansion is a nice one. I like to just pick a dusty taverna in the center of town, get a plate of olives and a glass of retsina and stare out at the sea. It's not that I'm all that fond of retsina, but drinking it is one of those rituals I need to get my bearings and convince myself I'm finally in Greece. The only recommended beach near Hydra Town is Mandraki, a 20-minute walk east of town, but there are others if you follow the paths out of town to the east or the west. A walk up the hill gets you good views of Hydra Town (see the picture on the right). There is plenty of nightlife in Hydra Town in the summer as Hydra is populated by young Athenians then. The upper crust of these is the outstanding three-star Hotel Mistral. If the hotel/guest house thing doesn't work for you, a beach or townhouse might be better for families, romantics, and for longer term stays. There is a good selection of Saronic Island vacation rentals at HomeAway. Don't Dismiss Patras, Greece - Especially During Carnival Season!